Business these days is global. With more and more people going online all over the world it’s never been so important to be able to communicate with potential clients in different markets. Although we still see the internet as a primarily English language technology, the percentage of native English speakers connected is steadily declining. This is the reason why a multilingual plugin for WordPress is so crucial for many firms. 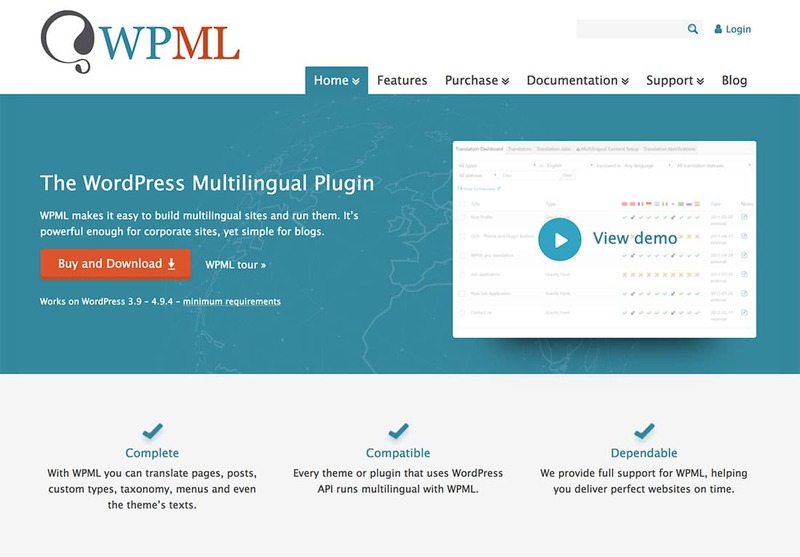 WPML is the most popular professional plugin solution to display your site in multiple languages. What are the languages of the web? 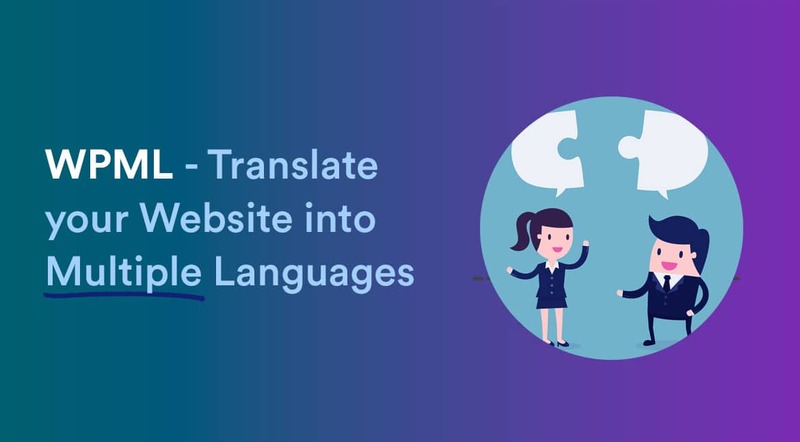 Coupled with a study from India that shows that people have more faith in content presented in their native language – it’s more important than ever to address these needs and give your business an edge over competitors with a multilingual website. WPML is a multilingual plugin for WordPress which allows you to easily translate your content and turn your business website into a truly globally-focused one. 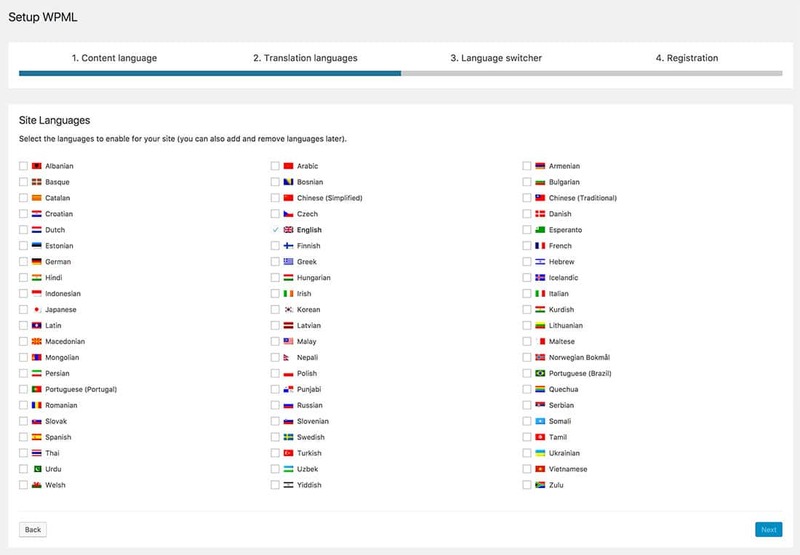 You can display a drop-down language switcher or a series of flag icons on your website to allow visitors to switch easily to a different tongue. Plus, with over 400,000 users and supported by 85 full-time staff, WPML is in constant active development – crucial for a plugin this important to so many businesses. It’s important to note that WPML doesn’t translate your content. It rather gives you the ability to translate, either by yourself or via sending your content to translators. This version allows you to translate posts and pages but not the navigation, widgets, custom fields, eCommerce, theme strings. I wouldn’t recommend this version. I’d choose the CMS option – as you can translate everything. The only caveat is that yearly updates will cost $39 every 12 months, and it’s important for a plugin like this to be kept up to date. Updates are free for life – it’s a one-off purchase, and you won’t pay anything else. It is considered one of the best multilingual plugins for WordPress as it covers almost every major page builder such as Elementor, Beaver Builder and Visual Composer. In addition, it can translate content created via popular plugins such as WooCommerce, Gravity Forms and Ninja Forms. Once you’ve chosen your primary language (in my case English) – you can choose from 63+ languages to translate your website into. It’s just a matter of ticking the checkboxes next to the flags, plus you can remove a language later if you wish. Next, you can configure the menu switcher. Pick the menu it should be inserted into and choose the order of the languages and whether to display a flag or not. There are also some basic styling options and you could also use some custom CSS yourself to tweak the look. Now that the languages have been selected, you can start translating your post and page content. When editing a post a new ‘Language’ panel appears on the right-hand-side. Clicking the plus icon next to the flag creates a copy of that article in the particular language you’ve chosen. 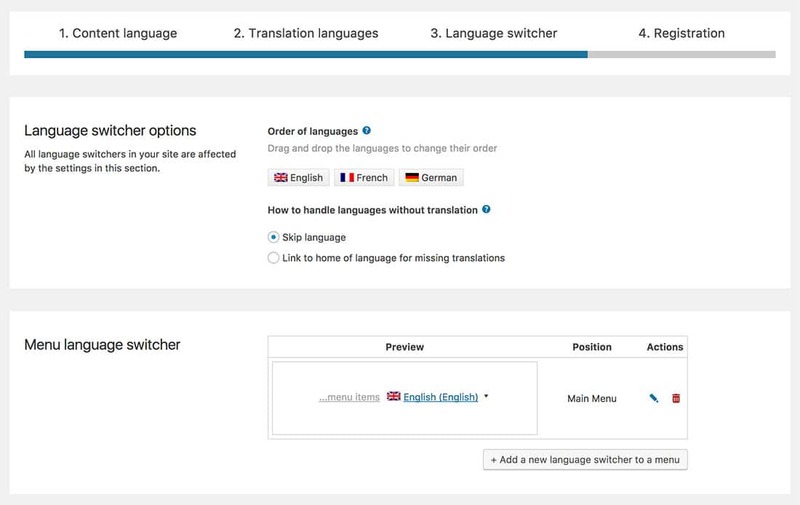 Building up the additional language versions of each is very simple – you’ll also be able to tell from the list view in WordPress whether a translation exists for every article on your site. It’s important to remember that if you have not translated a particular page, for example, it will revert to the default language. So, for this to work really well, you’ll need to spend the time creating language versions of all content. This is what the result looks like within the Success WordPress theme – a neat language selector drop-down with French as a choice as this particular news post is available in that language. You can have installed and activated WPML within minutes, the simple four-step process goes from choosing a default, picking the translation languages, setting up the switcher to activating the plugin. Or give you access to translation services, integrated within the plugin who can do the translations directly on your site. Powering nearly 30% of eCommerce, WooCommerce is a major player if you’re selling goods and products online. There are potentially vast untapped revenue streams available to businesses if they provide their catalog in different languages. WPML integrates seamlessly with WooCommerce as well as other plugins, popular with businesses such as Gravity Forms and Ninja Forms. The $199 ‘Lifetime’ option is a great choice for serious businesses I think – giving you the ability to use it on unlimited sites. Plus you get access to free updates permanently with no extra charges in the future. WPML includes vast amounts of excellent documentation with tonnes of tutorials and knowledge base guides on setting up and configuring the plugin. Their support team is also excellent I’ve found, with very quick email response times. WPML also includes 30-day trial period whereby you test the plugin and see if it’s the right choice for your website so there’s no risk. With many plugins and themes falling by the wayside after a few years, there’s real added security in seeing that WPML is backed up by a substantial team behind the scenes, ensuring its continued development going forward, which means less risk for your business. For a website to better target global customers, it’s definitely worth taking a look at the WPML plugin. A multilingual website could well be the best business decision you make in 2018.